Traveling with your own group to New York requires proper organisation and planning. When you travel with a group, it is extra important to organise everything in advance, as well as possible. As a British New Yorker, I would like to help you organise your trip. I can give you my input regarding the best possible planning for your group trip. 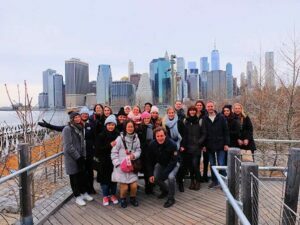 When you go to New York with a group of school children, your family or company, I always recommend you to book certain activities and make arrangements well in advance. Would you like to know what I can do for you regarding your group trip to New York? Please complete the form below and I will contact you as soon as possible! When you let me (partially) organise your group trip to New York, you are guaranteed to be properly prepared before you leave. I have many good contacts with tour operators, guides, sport teams and theatres, all of whom I work with a lot. That is why I am able to arrange attractive prices for you, but more importantly: I can make sure that you are assisted by trusted parties when you are in New York. Additionally, I will naturally provide you with advice on how you can best plan your trip. I can prepare a daily schedule and an evening program for you, fully adjusted to the group’s wishes. Are you travelling with at least nine people? Please complete the form below and I will contact you as soon as possible. Please note: Group trips can be a challenge. Besides the obvious fun involved, things can also go wrong. I would like to help you plan your group trip. Together we can ensure that all pre booked activities will be efficiently organised and run smoothly for your trip. If you hire me, you will not experience any closed doors in New York and there is little chance that you will face any setbacks. However, NewYork.co.uk is not a travel agency and I am not a local tour guide. For urgent problems with tickets organised by myself, you can always contact me. In case of any other problems, I can always assist you with searching for a solution. Are you going to New York with less than 9 people, but you would still like some help with your preparations? Please send an e-mail to eric@newyork.co.uk and I am happy to assist you!